Nestled in the midst of the Thar Desert, Bikaner is one of the largest cities in Rajasthan and is known for is centuries-old monuments and age-old culture. Therefore, it has become a dream destination for every history lover over a period of time. Founded in the late 15th century by Rao Bika, a Rajput king, this historic city was once a land of deep thick forests and was called Jangladesh, i.e., the land of forests. Today, it is flourishing as one of the most significant cities in the state and is visited by millions of tourists every year. Even though it is mainly popular for its palaces, forts and heritage hotels, it is also visited by thousands of Hindu pilgrims on account of the presence of several ancient religious sites within its boundaries. As it is located in the vicinity of Jaipur, it makes for an ideal weekend getaway for every traveller in and around Jaipur. Wouldn't you love to savour this alluring beauty and its glamour? Read on to know more about how to reach Bikaner and its mesmerising tourist spots. Lying in a hot semi-arid region with extreme temperatures and a little rainfall, Bikaner is not a preferred destination during the summer season. The best to visit this historic town is from October until the end of February. During this period, the temperature is optimum and the weather is pleasant. Hence, you can roam around and explore its beauty comfortably during this period. By Air: If you desire to travel by air, then you need to catch a flight to Jodhpur Airport and then from there, either a bus or cab to Bikaner. The road distance between Jodhpur Airport and Bikaner is 250 km. By Rail: Bikaner has a well-maintained railway station and hence, you can catch a direct train from Jaipur railway station to Bikaner Junction. It will take you an approximate time of 6 h 30 min to reach your destination by rail. By Road: Bikaner is easily accessible by road on account of its commendable road connectivity. As route 1 will take 1 h lesser in comparison to the other route, you can reach your destination from Jaipur within 5 h 30 min. Hence, it is the preferable route to Bikaner. On your way, you can also visit Fatehpur and explore its historical sites. Fatehpur is located at a distance of about 172 km from Bikaner and 174 km from Jaipur and is known for its ancient temples and other historical monuments. Even though it is not a popular tourist spot, it still makes for a perfect weekend getaway amongst history lovers on account of its majestic palaces and centuries-old stepwells. The history of Fatehpur dates back to the early 16th century when it was established and ruled by Nawab Fateh Khan, the founder of the city. The prominent places which will certainly interest you include Fatehpur Fort, Jagannath Singhania Haveli, Saraf Haveli and Goenka Haveli. The city is also home to several religious sites, such as Ashram Temple. Situated at a distance of about 330 km from Jaipur, Bikaner is one of the few historic places in India which no traveller can afford to miss. From learning in detail about the culture and history of Rajasthan to feeling the royalty, there is a lot to enjoy here. So, why think a lot over a tour of Bikaner now? You cannot encounter such an amazing spot everywhere in India. So, without giving any second thought, be on the roads leading to this unforgettable destination. Following are the major places here which you must visit on your first trip. 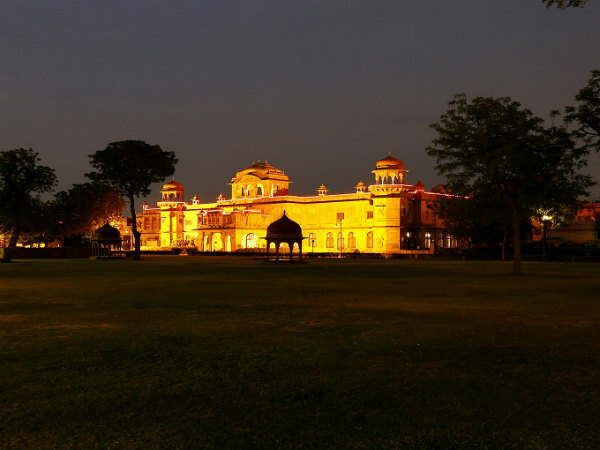 The former residence of the king of Bikaner, Laxmi Niwas Palace is the most popular tourist attraction in the city and hence, it is certainly one thing which completes the beauty and glory of Bikaner. Built out of red sandstone and surrounded by a beautiful garden, this majestic palace was constructed in the late 19th century. However, it is serving as a luxury heritage hotel to the tourists today. You must catch a glimpse of this architectural wonder if you desire to feel the royalty of Rajasthan. If there is something which summarises the history of Bikaner, then it is assuredly Junagarh Fort. Built in the late 15th century by Rao Bika, the founder of Bikaner, this monumental beauty houses several beautiful palaces and temples within its boundaries. However, today, the fort is acting as a museum and a tourist site for history lovers. With beautifully designed arches, commendable artwork on the walls and ceilings and an enthralling facade, Junagarh Fort is a beauty which cannot be described in words. You really need to capture its captivating grandeur from your own eyes to believe its majesty. Another gorgeous palace acting as a luxury heritage hotel, Lalgarh Palace was built in between 1902 and 1926 to serve as a royal residence for the king of Bikaner, Sir Ganga Singh. It is one of the few palaces in Rajasthan which are flawless instances of Indo-Saracenic architecture. With guest suites, grand halls, large swimming pools and royal architecture, it stands as one of the most beautiful palaces in the entire state. Ever heard of the temple of rats? If not, here is Karni Mata Temple. Located at a distance of about 30 km from the city centre, Karni Mata Temple is dedicated to Goddess Durga and is renowned for the presence of more than 20,000 live rats within its boundaries. These rats are considered as holy entities and are known as Kabbas. Doesn't it seem like an interesting place which must be explored? Karni Mata Temple is one of the most popular temples in Rajasthan. You can also explore the beauty of several other tourist places in Bikaner which include Mukam Bishnoi Temple, Bhandasar Jain Temple and Laxminath Temple.